A week after the Foundation's meeting, one of Zechs' subordinates arrives with the order to blow up Gundam 01. Zechs suspects that the unexpected delay is a consideration of Treize, telling them to think of some kind of measure in that time if necesssary. Taking still two days more, Zechs carries out the detonation. Gundam 01 is now lying on the slope by the Victoria lake. The engineers, knowing the strength of Gundanium and the structure of the hull very well, have now installed a huge quantity of explosives. Zechs is commanding the detonation from the bridge of a boat swimming on the lake. Zechs nods as he receives the report that the installation of the explosives is finished. Reacting to Zechs' order, the engineer Maser, who is responsible for the installation of the explosives, performs the countdown and presses the switch for the explosion. After a moment's timelag, the Gundam's hull swells up together with a flash, and fragments scatter in all directions while a loud roaring sound is emitted. Some small pieces even come close to the boat, which should have been at a good distance, and splash up water from the lake. After the wind has blown away the smoke rising from the explosion's spot, a skeleton-like figure with its armor ripped away appears there. The frame has bent because of the high temperatures and there is no trace left of the cockpit. It's totally as if Heero's self-destruction has been repeated. "The destruction of Gundam 01 has been completed, Inspector Acht." Having observed the remains with a field glass, Maser turns towards the destruction supervision members sent by the Foundation. "We certainly saw this with our own eyes, but may we collect the fragments?" Acht, a slightly fat, middle-aged man, shifts his round glasses up as he ask Maser this. "Are you not satisfied with something in the data we submitted?" Acht bends his lips into the form of a smile at Maser who is frowning. "I think I would like to verify this with my own eyes. It can't be that I make report which the hard-headed Romefeller members do not agree to." "Feel free to do so." Zechs nods generously, then he bows slightly to Acht and his entourage before leaving the bridge. "Well, there probably are no more suspicious points. He is not a man to simply show his weaknesses, this man called Zechs Merquise." After transferring into a motorboat which has come alongside, Acht murmurs this to himself while heading towards the explosion's site. "There were no Gundam parts in the Lake Victoria base." A figure in a black suit and with sunglasses, who is sitting behind Acht, reports this. "That guy is a man who loves mobile suits. He is not a man who will act differently because of us." "Is it of advantage to Zechs if he disobeys the Romefeller Foundation?" "I do not know Zechs' thoughts. Romefeller has started to set in motion this era. If Zechs' treason can be proven, it would be favourable for winning the favours of the brilliant wealthy class." Acht looks up to the destroyed Gundam, which is coming closer. "I guess it's time a report from another side comes in. If that happens, I'll get to see how Zechs becomes a traitor." Acht murmurs this while laughing slyly. "He is searching with a fine comb because he wants to win a few points with the Foundation, that Inspector. No matter how much he investigates, no data will come out which is different from the documents." Looking after the inspector's leaving motorboat, Maser shrugs at the masked superior officer standing beside him. "Sorry to have you playing in such a boring drama" says Zechs to Maser. The blown up Gundam was a dummy made in a hurry from spare parts of Tallgeese and left over Gundanium alloy. Because fortunately OZ does not have any detailed data of the very complicated cockpit either, the deception has worked. Additionally, because so much explosives have been used, the dummy has been destroyed so completely that nothing of the original form has been left. More than the facts written in the report, which bases on fragments, are most likely not known. "Me too I think that it would be a pity to destroy 01 so soon. However, most of the spare parts of Tallgeese have been used up due to this." "I see. So from now on I can't break anything accidentally." At Zechs' serious tone, Maser laughs as if he had heard a joke. "There is nowhere a pilot which could hurt the Major or Tallgeese." "No, there is indeed at least one." The figure of the 01's pilot, Heero Yuy, is crossing Zechs' mind, even if he doesn't know whether he is alive or not. 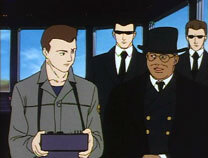 At that time, Heero and Trowa are in a Sicilian port city, which is facing the Mediterranean, in order to meet Field Marshall Noventa's wife. "This was the last one. Are you satisfied?" Trowa asks Heero this as they are passing through the gate of a large estate located on a hill. "It's not something so simple." 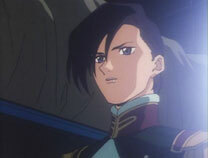 Heero has met all seven people who were closely related to the Field Marshall and has, like when he met Sylvia, handed them a pistol and asked for their judgement. Some were angry, some were weeping and others were whispering 'go away' without saying anything else. He doesn't know whether he has been pardoned or not. However, Heero cannot choose any other method. Noventa's elderly wife, seemingly with a gentleness similar to Sylvia, has just shaken her head at Heero who had presented her the pistol, and hasn't said anything more. Heero could not read whom her seemingly sad expression was aimed at. In any case, this was the last atonement in this way. "You can't forgive yourself that you killed a pacifist, even if it was a mistake. Additionally, you were thoroughly tricked by OZ. It's not that I can't understand it, but to entrust the family of an opponent you killed with your fate...."
"I want to do it only this way." At Trowa's skeptical words, Heero returns a brusque answer and descends the hill road which leads towards the harbour. "What do you feel like doing from now on?" Trowa asks this as they are walking along the stone paved street. When Heero asks back, Trowa is at a loss for an answer. 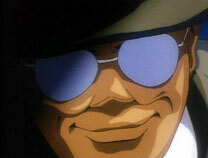 That's because he came here watching over Heero's actions, without having anything else to do. "It seems we both are without aim." After a five minute walk, they enter the center of the city. It's not such a big city. It's a city at the sea with a prospering fishing industry. "By the way, did you notice?" Close to where they entered the main street with its clusters of booths here and there, Trowa whispers this to Heero who is standing beside him. "Yes. It's the black car, isn't it. It has been following us since we left the estate." Heero answers without looking back. "I was thinking that it was only a question of time until somebody discovered us if we kept doing these kind of things" murmurs Trowa. "I'll take care of it and come back." Heero answers in his usual even voice. Trowa stops him with a gesture. "Wait. Don't overdo it with your body. I'll stop these guys." As soon as he had said this, Trowa turns around and starts towards the car behind him. The shocked driver of the pursuing car does an emergency breaking. Nimbly, Trowa jumps onto the hood and just as nimbly jumps off the rear of the car again. Then he saunters off as if nothing has happened. The men following them have been distracted by Trowa's unexpected action and during that moment, they have not noticed how Heero has hidden in a side road. Hurriedly scrambling out of the car, they start running, following straight after the escaping Trowa. Trowa looks behind and verifies that the pursuers have concentrated on him, then he goes into a side road. While the pursuers perfectly adjust their speed in order not to lose him out of sight, they run along the street they filed into. "I guess it's okay now" murmurs Trowa. Dragging around the pursuers, he has been running for a few minutes without even getting short of breath. Then he looks around the surrounding. On both sides of the narrow street, apartment houses of five and six floors are standing one beside the other. Between them, ropes are put up in order to let the laundry dry. Even now shirts and sheets are swaying in the dry wind. "I think I'll use this...."
Trowa jumps at a rope put up in the second floor and pulls his body up. Then he jumps to an even higher rope. 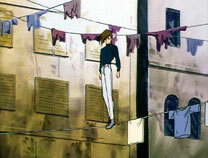 Within a few moments, Trowa is standing on a rope at the height of the fourth floor. Because the laundry is in the way, he cannot be seen from below. However, even if this were not the case, the pursuers are not even looking up. The pursuers are walking away while looking around the surroundings. "We must not raise any commotion in such a place." After murmuring this on the swaying rope, Trowa starts walking quickly towards the nearest window. The place Trowa has specified to meet Heero is a warehouse in the harbour, where the trailer loaded with Heavyarms is hidden. 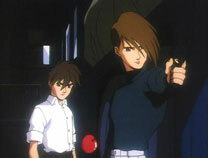 After Trowa has entered the gloomy warehouse, where the lights have been switched off, Heero throws him an apple, maybe with the intention of thanking him. Catching the apple with one hand, Trowa gazes at the trailer in the hangar. "Well, when we have to convey this guy, land transportation is not possible." "There is a ship I have an eye on. But, if these people don't let us out of their sight, this will be difficult too." As Trowa is walking into the warehouse while thinking, a calm voice resounds from the barely open door of the warehouse. "You may use my cargo plane." Heero and Trowa draw their pistols at the same time and point them in the direction the voice is coming from. "Impossible, you are really still alive." The voice murmurs this without showing any semblance of fear. Stepping into the dim light is a woman wearing the uniform of an OZ officer. 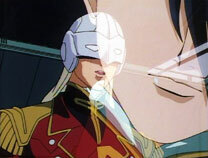 "I am Lucrezia Noin, a subordinate of Major Zechs." Heero asks this the woman who introduced herself as Noin. "He's the pilot you fought with in Siberia." "The pilot of that white mobile suit?" Heero remembers the figure of the mobile suit which was even a size bigger than the Gundam and was, according to the data, a Leo prototype. If this is so, then that makes him also the pilot he fought with when descending onto Earth. 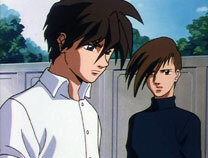 Heero repeats his enemy's name, which he hears for the first time, in his heart. "We cannot allow to be captured without resistance." Without wavering in his aim, Trowa says this calmly. "Major Zechs would like to meet you." "To meet us? Does he think he can draw out any information from us?" "Please don't misunderstand me. Zechs would like to meet you as a mobile suit pilot, not as an OZ soldier. Then, he wishes for another battle with you, with Heero Yuy." "Wishing for a duel? He's a really great man, that Zechs." "It depends on you whether you believe him or not." After lowering the pistol, Heero answer within a moment, showing he didn't even think about it. "I cannot tell you the place." Noin shakes her head. Thinking of the investigation party, she has judged it safer to keep the place a secret until the last moment. If they don't trust her on basis of this, she will tell them as a last mean. Trowa's question is not a doubt, but a verification. "That guy is not somebody who sets a trap." The experience of having fought the enemy twice tells Heero of his very honest character. Noin smiles slightly at the exchange of the two. Zechs has forbidden her to speak of 01. "So, let's wait for the night to bring this in. Until then, please stay here." After telling this to the two, Noin leaves the warehouse. In the cockpit of the blue cargo plane, Noin reports to Zechs after she has left the loading of the trailer to her subordinates. "Guess he is alive after all, Noin." Zechs voice sounds as if he's triumphant. "Indeed. He has an astonishing ability to survive." "I'm sorry, I made you do only superfluous things." "I am a mobile suit pilot too. I intend to understand your feelings a bit." "Thank you, Noin. 01's last adjustments have to be done in time then." "I think it will last up to two days to arrive at your place." "Understood. Please watch out carefully for the pursuit by the investigation party. In this one matter I cannot send you any support. Please deceive them by yourself." Cutting the connection with a salute, Noin looks down through the window on the situation outside. There is no suspicious ship on the sea outside. The surroundings of the harbour are watched by her subordinates. Just like Noin has thought, the investigation party have their eyes on the cargo plane. 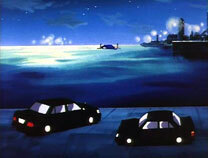 A black car has stopped on the seaside road, from where one can enjoy a panoramic view over the pier with the cargo plane anchored there. From that car, Inspector Acht explores the situation in the harbour. "It's an OZ cargo plane after all. It seems subordinates of Major Zechs are using it" reports Acht's subordinate. "I see. Maybe these guys are in there as well." Acht murmurs this as he is looking at the cargo plane which has started to load something as the night has fallen. "Is it fine to let them be just like this?" "Don't be impatient. These guys will for sure show their true colours. Until then, don't lose them out of your sight. I won't let them do as they please any more than this." Acht twists his thick lips and shows a cruel smile.